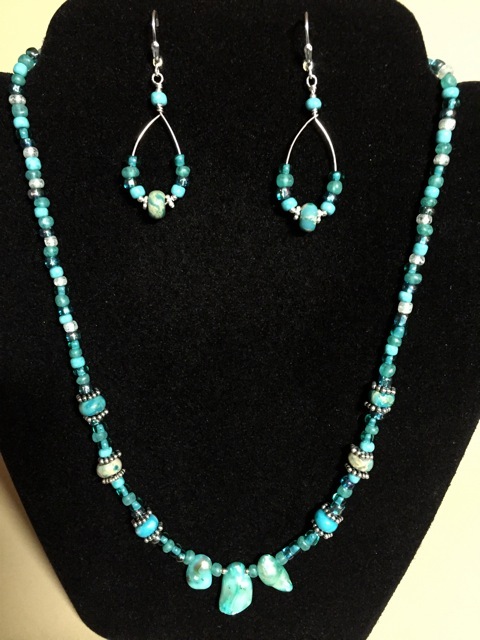 Multi-colored Turquoise Necklace with Jasper, Pearls, Glass & Sterling Silver; Matching Earrings available. Dangle earrings have sterling silver lever backs. Necklace is 19 inches long, with Sterling Silver oval clasp. Pearls are for the 3rd and 30th anniversary/birthday. The 5th Chakra, Throat, for light blue colors, eases communication difficulties, helps you express yourself and brings peacefulness. Jasper, for the Base/Root Chakra, helps with grounding and protection.